Cat treat recipes courtesy of Facebook group "Homemade Dog Treats." These homemade cat treats started out as liver dog training treats. 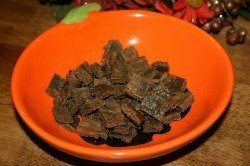 "I just made a batch of liver training treats for my dogs. 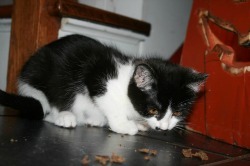 I dropped one on the floor and my kittens pounced on it! They loved them! Even my older cat liked them. The recipe is gross smelling, gross looking and the finished product is equally as smelly and ugly but if the fur babies love it, I guess I'll make them! Here is the recipe I used:"
Line a 10 x 15 inch jellyroll pan with parchment paper. Place the liver into a food processor. Pulse until finely chopped. If you have room, add the flour and eggs. Process until smooth. Otherwise, transfer to a bowl, and stir in the flour and eggs using a wooden spoon. Spread evenly in the prepared pan. Bake for 15 minutes in the oven, or until the center is firm. Cool, and cut into squares using a pizza cutter. The treats will have a consistency similar to a sponge. The treats are very smelly. Cut them into small squares and put them into the dehydrator to cut down on the "aroma". Pupcakes Pet Bakery is located in Kentucky. The bakery makes dog training treats and other dog treats as well as cat treats. It is a family run business and the entire family gets involved in making the treats, including the animals, as shown in this photo of Mia the cat taste-testing the liver cat treats.